Pork and salsa verde go so well together. 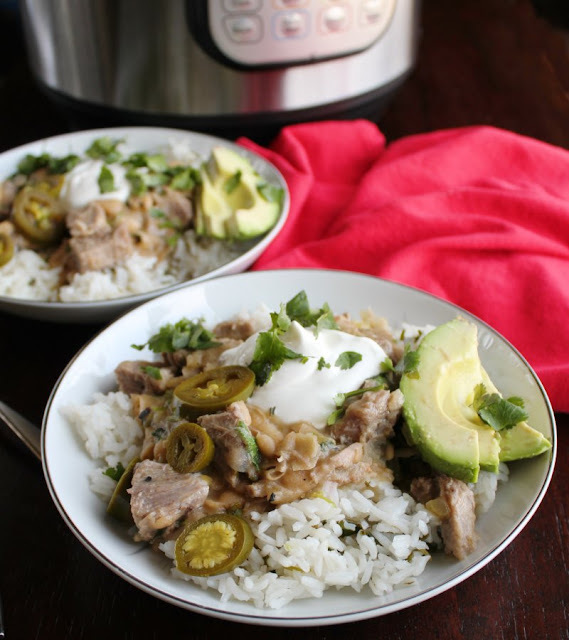 Bring them together in this simple instant pot meal that is delicious served over rice for burrito bowls. Turn inexpensive pork roast into a flavorful dinner. The salsa verde takes simple ingredients and turns them into a quick dinner with the help of a pressure cooker. Serve it over rice with your favorite toppings for a homemade burrito bowl that rivals what you could get at a restaurant for a fraction of the cost! We are big burrito bowl fans. 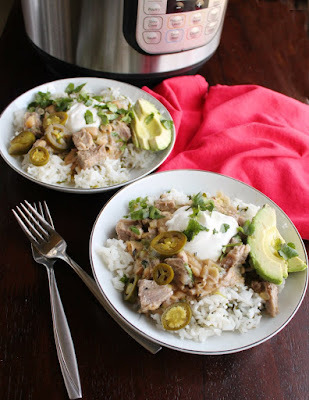 We have been enjoying slow cooker salsa chicken for years. 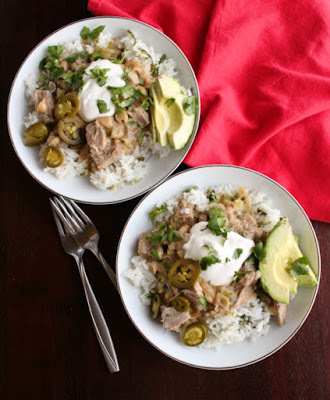 Recently I converted that slow cooker meal into a quicker instant pot salsa chicken variation. You can start with frozen chicken breasts and dried beans and still have dinner on the table in under an hour. I love the simplicity of both recipes and the big flavors they produce. They are the ultimate in dump and go convenience. As good as they are, sometimes it is fun to switch things up. So recently I made a batch with salsa verde and white beans. The salsa verde added a fun new flavor element that can't be replicated with red tomato salsas. I thought a creamy white bean would be a good change as well. Boy was I right. I could have eaten the results straight out of the instant pot with a spoon. The first batch kept chicken as the main protein. It was delicious, but it was too dark to get decent pictures to share with you. It's ok, we liked it so much that we didn't mind turning around and having it again a week later. This time there was another change in order. One of my favorite uses of salsa verde is with carnitas. So I decided to use pork in a nod to that combination. It was fabulous! The larger chunks of pork I used do require a longer cook time to get them tender. So dinner isn't ready quite as quickly as the chicken version, but it is still hands off and quick enough for our standard weeknight. If you are in a hurry, you could cut your pork into smaller cubes and reduce the cooking time. If you are ok with the longer cooking time, feel free to sub in dry beans. You could quickly rinse your favorite white beans and chuck them in basically straight from the bag. Be sure to adjust the water you add accordingly. One and a half cups of beans and three cups of water should get you tender beans with a good consistency of sauce. Be sure to have some lime cilantro rice ready to go. It is the perfect base for your burrito bowls. We like ours with sour cream, avocado and jalapenos. Crumbled queso fresco and some lightly pickled onions would also be delicious! I'd love to hear all about your favorite instant pot meals. Share your best combinations and tips in the comments! Cut pork into fist sized chunks. If you have the time, go ahead and brown it using the saute function of the instant pot. Add diced onion, beans, garlic powder, cumin, salsa verde and water to instant pot. Cook on high pressure for 25 minutes and then allow pressure to release naturally for at least 10 minutes. Shred or chop the pork. If you would like to thicken the sauce a bit, stir in a slurry of 1 Tablespoon water and 1 teaspoon corn starch. Turn on saute function and stir until the mixture is bubbly and thickened. Serve over rice with your favorite toppings. Use whatever pork you have on hand. A sirloin roast, chunks of loin or even some pork shoulder would work fine. Any creamy white bean would be good here; canellini, great northern, even chickpeas. Use whatever you have on hand. 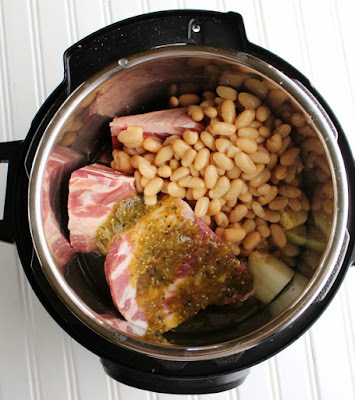 If you would like to use dry beans instead of canned, this is a great recipe for that. Add about 1.5 cups of dry beans and increase the water to 3 cups. I can't get over how yummy this looks! And made in the Instant Pot? I'm sold! It makes it so quick and easy! This salsa Verde looks like it turn out wonderful. I love how fast the Instant Pot is! Thanks for sharing this amazing recipe. 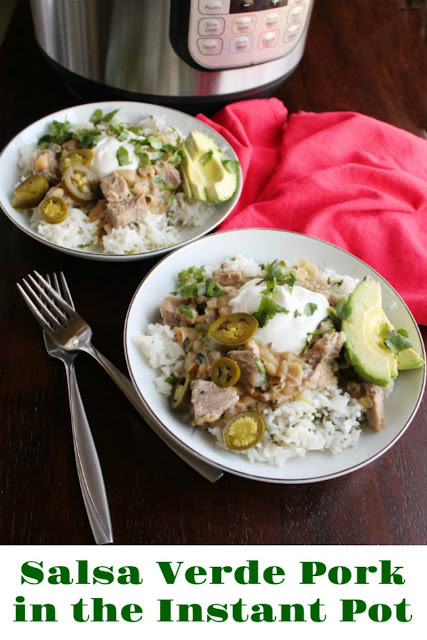 Your Burrito Bowl looks wonderful we will really enjoy this recipe! Thanks for sharing with us at Full Plate Thursday and have a good week! Mmmm.... This sounds so delicious!! And probably a great one to divide up and take for lunches too! That's exactly what I did! I love taking leftovers for lunch!